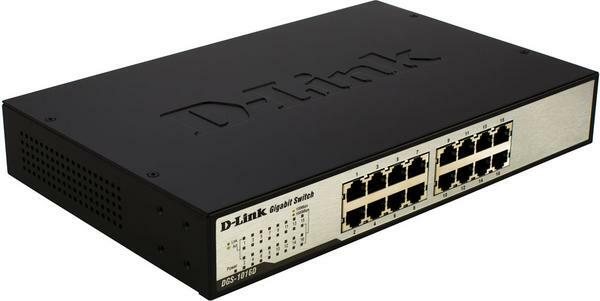 This section will explain how to connect Ethernet devices to your new D-Link switch and how to mount the switch. 2. Firmly attach the ears to the rack as shown. Please follow the usual safety precautions for rack-mountable products. Use rubber feet provided. 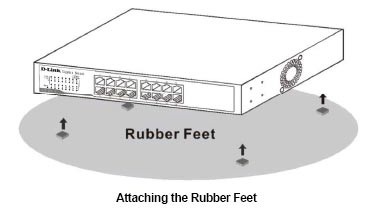 Position and apply rubber feet to the underside of the DGS-1016D/1024D switch. CAUTION: Do not place any device on top of switch, or place the switch on top of any device or object that will block the free flow of air through the ventilation slots on the sides, top, and bottom of the switch’s case. In addition, care should be taken not to locate the switch next to, on top of, or underneath any device that generates a significant amount of heat. For the switch to perform at its optimal level, the switch must have adequate ventilation to prevent the switch from overheating and becoming damaged. To power on the switch, Plug-in the female connector of the provided power cord into this socket, and the male side of the cord into a suitable power source. After the Switch is powered on, the LED indicators will blink briefly while the system resets. As a precaution, in the event of a power failure, unplug the switch. When power is resumed, plug the switch back in. NOTE: All Ethernet ports auto-detect MDI-II/MDI-X, port speed (10, 100, 1000Mbps) and duplex of the device connected to the switch. • For connections to 10BASE-T and 100BASE-TX devices, use Category 5 or 5e UTP/STP cable. • For connections to 1000BASE-T and 100BASE-TX devices, use Category 5e or better UTP/STP cable. All 1000BASE-T connections operate in full duplex mode. NOTE: UTP (Unshielded Twisted Pair) Ethernet cabling is adequate for most small office environments. More expensive STP (Shielded Twisted Pair) can also be used, but is generally only needed where there will be risk of strong Electromagnetic of Radio Frequency Interference. • A 100BASE-TX hub or switch can be connected to the switch via a twisted-pair Category 5/5e UTP/STP cable. 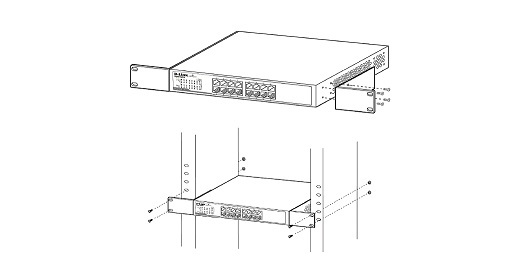 • A 1000BASE-T switch can be connected to the switch via a twisted -pair Category 5/5e or better UTP/STP cable. The DGS-1016D/1024D switches were designed for easy installation and high performance in an environment where traffic on the network and the number of users increase continuously. The LED indicators of the switch include Power, 100/1000Mbps, and Link/Act. The following shows the LED indicators for the switch along with an explanation of each indicator. Comprehensive LED indicators display the conditions of the switch and status of the network. A description of these LED indicators follows (see LED Indicators). The LED indicators of the switch include Power, Link/Act, 1000Mbps, and 100Mbps. This green indicator illuminates when the switch is receiving power. This green indicator illuminates steadily when a port is connected to a station successfully and has a good link. The indicator will blink to indicate that a port is transmitting or receiving data on the network. This indicator is amber-colored when the port is connected to a 100MbpsFast Ethernet station. It is green when the port is connected to a 1000Mbps Ethernet station. It is not illuminated when the port is connected to a 10Mbps Ethernet station. Gigabit Ethernet Auto-Negotiating ports (10/100/1000Mbps) Comprehensive LED indicators display the conditions of the switch and status of the network. The power cable connection is located on the rear panel of the switch. Switch power input is provided by and internal universal power supply (100-240VAC : 50-60Hz, 0.4A Max: 12V/3.3A). The AC power connector is a standard three-pronged connector that supports the power cord. Please see the Power On section below for instructions on how to properly connect the switch to a power source. This article teach you how to switch D-Link Advanced Settings. Step 1 Open a web browser and type the IP address of the switch in the address bar (default is 10.90.90.90). Press Enter. Step 2 Both the default username and password are blank (nothing). Click OK. Step 3 On the left side, click Configuration and then click Advanced Settings. 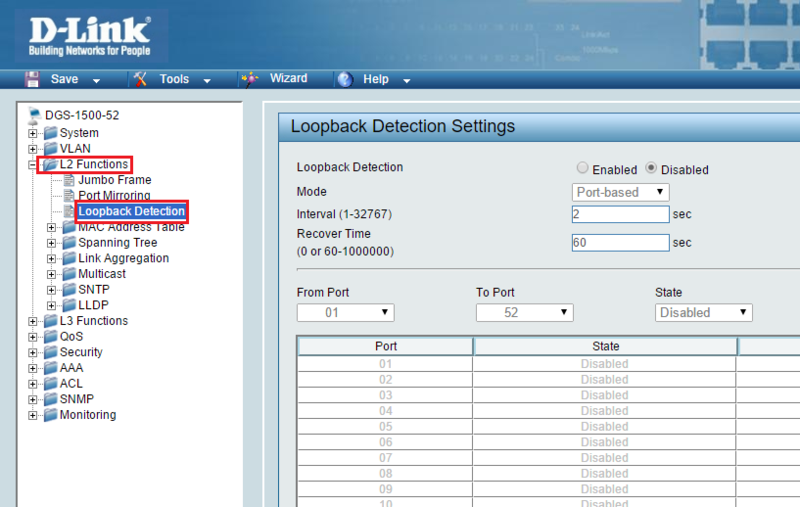 • Serial Port Auto Logout – This setting automatically logs out a user connected to the console port after a specified amount of time. Select 2 Minutes, 5 Minutes, 10 Minutes, 15 Minutes, or Never using the drop-down list. The default setting is 10 Minutes. 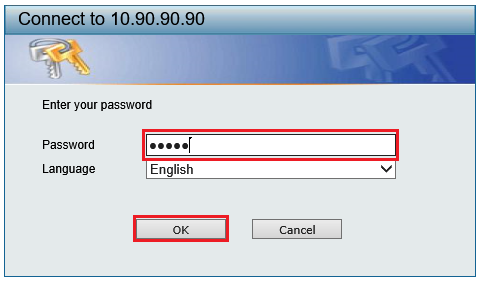 • Serial Port Baud Rate – This setting is locked down to 115220 and cannot be changed. Users connecting to the console interface of the switch must use this baud rate. • MAC Address Aging Time (10-1000000) – This field specifies the length of time a learned MAC Address will remain in the forwarding table without being accessed (that is, how long a learned MAC Address is allowed to remain idle). The default age-out time for the switch is 300 seconds. To change this, type in a different value representing the MAC address age-out time in seconds. The MAC Address Aging Time can be set to any value between 10 and 1,000,000 seconds. • IGMP Snooping – Select Enabled to enable this feature or Disabled to disable it using the drop-down list. Enabling IGMP snooping allows you to specify use of a multicast router only. IGMP Snooping for individual VLANs needs to be configured on the IGMP Snooping page in the IGMP folder. • Multicast router Only – Select Enabled to support Multicast router only or Disabled to disable it using the drop-down list. • GVRP Status – Select Enabled to enable GVRP or Disabled to disable it using the drop-down list. 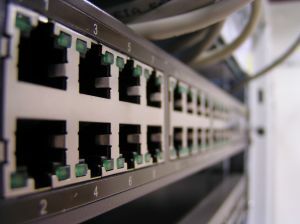 GVRP allows the switch to exchange VLAN configuration with other GVRP enabled switches, prune unnecessary broadcast traffic and unknown unicast traffic, and dynamically create and manage VLANs on switches connected through 802.1Q trunk ports. • Telnet Status – Select Enabled to enabled administration of the switch via Telnet or Disabled to disable it using the drop-down list. This feature is enabled by default. • Telnet TCP Port Number (1-65535) – Enter the port number for administering the switch via Telnet. The default port is 23. • Web Status – This indicates if web-based administration is enabled. Web-based administration is configured on the IP Address page in the Configuration folder. The standard port used for web-based administration is 80. • RMON Status – Select Enabled to allow Remote Monitoring (RMON) of the switch or Disabled to disable it using the drop-down list. • Link Aggregation Algorithm – This is the algorithm that the switch uses to balance the load across the ports that make up the port trunk group. Select MAC Source, MAC Destination, MAC Src & Dest, IP Source, IP Destination or IP Src & Dest using the drop-down list. • Switch 802.1x – Select Enabled to enable 802.1x for MAC-based or Port-based 802.1x function or Disabled to disable it using the drop-down list. This feature is disabled by default. Port-based 802.1x function will base authentication only on the port number. MAC-based 802.1x function uses the port number and specified MAC address as configured in the 802.1x Initialize Ports menu. • Auth. Protocol – Select Local Eap or Radius Eap using the drop-down list. The default setting is Radius Eap. • HOL Prevention – Select Enabled to enable Head of Line (HOL) Protection or Disabled to disable it using the drop-down list. • Jumbo Frame – Select Enabled to enable support for Jumbo Frames up to 9216 bytes or Disable to disable using the drop-down list. • Syslog State – Select Enabled to enable Syslog State or Disabled to disable it using the drop-down list. The default setting is Disabled. With Syslog State enabled the switch can report activity to a Syslog server. Step 5: Click Apply to save the settings.